Infinity is surely the strangest idea that humans have everthought.Where did it come from and what is it telling us about ourUniverse?Can there actually be infinities? Or is infinity just a labelforsomething that is never reached, no matter how long you go oncounting?Are infinities like numbers, with some bigger than others, andoneinfinity at the top, bigger than all the rest? Can you do aninfinitenumber of things in a finite amount of time? Is the universeinfinite? Is it infinitely old and will it continue to exist forever? Is matter infinitely divisible into ever-smaller pieces? But infinity is also the place where things happen that don't. All manner of strange paradoxes and fantasies characterise an infinite universe. If our Universe isinfinite then an infinite number of exact copies of you areat thisvery moment reading an identical sentence on an identicalplanetsomewhere else in the Universe. So what is it like to live in a Universe where nothing is original, where you can live forever,whereanything that can be done, is done, over and over again? These aresomeof the deep questions that the idea of the infinite pushes us to ask.Throughout history, the infinite has been a dangerous idea. Many have lost their lives, their careers, or their freedom for talking aboutit.The Infinite Book will take you on a tour of these dangerousquestionsand the strange answers that scientists, mathematicians,philosophers,and theologians have come up with to deal with its threatsto our sanity. 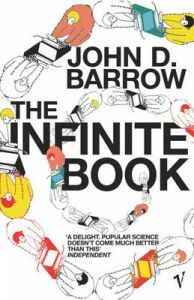 John D. Barrow is Professor of Mathematical Sciences and Director of the Millennium Mathematics Project at Cambridge University, Fellow of Clare Hall, Cambridge, a Fellow of the Royal Society, and the current Gresham Professor of Geometry at Gresham College, London. His principal area of scientific research is cosmology, and he is the author of many highly acclaimed books about the nature and significance of modern developments in physics, astronomy, and mathematics, including 'The Origin of the Universe' 'The Universe that Discovered Itself' 'The Book of Nothing' 'The Constants of Nature' 'The Infinite Book: a Short Guide to the Boundless, Timeless and Endless', 'The Artful Universe Expanded, 'and' New Theories of Everything,' and 100 'Essential Things You Didn't Know You Didn't Know'. He is also the author of the award-winning play 'Infinities'. Infinity is surely the strangest idea that humans have ever had. Where did it come from and what is it telling us about our Universe? Can there actually be infinities? Can you do an infinite number of things in a finite amount of time? Is the Universe infinite? Infinity is also the place where things happen that don't. What is it like to live in a Universe where nothing is original, where you can live forever, where anything that can be done, is done, over and over again? These are some of the deep questions that the idea of the infinite pushes us to ask. Throughout history, the infinite has been a dangerous concept. Many have lost their lives, their careers, or their freedom for talking about it. The Infinite Book will take you on a tour of these dangerous questions and the strange answers that scientists, mathematicians, philosophers and theologians have come up with to deal with its threats to our sanity.